LaTeX Font Warning: Font shape EU1/fxl/m/n' undefined (Font) usingEU1/lmr/m/n' instead on input line 5. LaTeX Font Warning: Font shape EU1/fxl/bx/n' undefined (Font) usingEU1/fxl/m/n' instead on input line 6. Does anyone know what's happening with the repositories? Is anyone able to get libertine to work on MikTeX? The libertine font type one has been changed for two times, the last one not long ago. There are two new packages supporting a part of the old libertine font. See question how does libertine type1 work. You can -- if you have an archive of the old libertine font (libertine-legacy) -- install the old font in a local texmf tree and use the old font without changing your existing tex documents. Not the answer you're looking for? Browse other questions tagged miktex libertine or ask your own question. 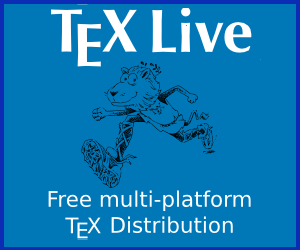 How soon do all CTAN mirrors update for TeX Live Utility to detect the changes?